Field trip! 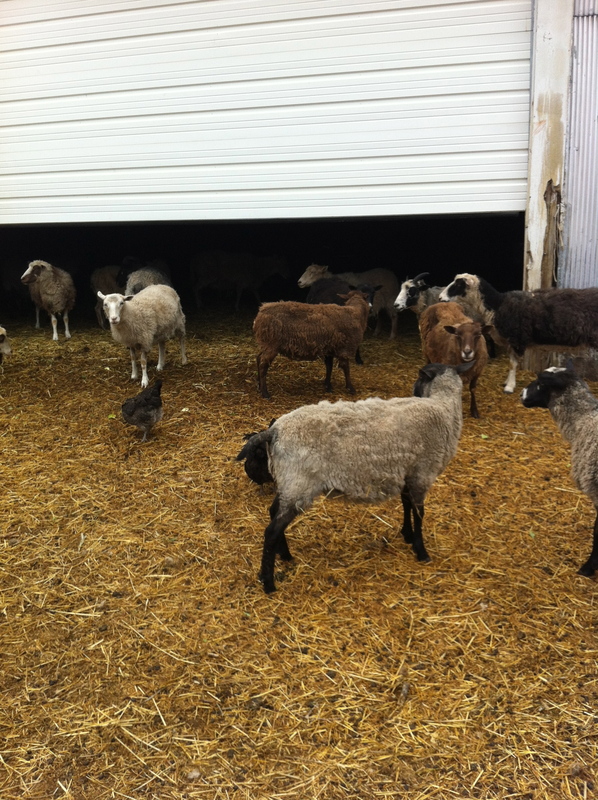 We had a great trip to Nancy Ellison’s farm near Zumbrota – DESPITE the cold and drizzly day, an anomaly following several perfect spring weeks in Minnesota. 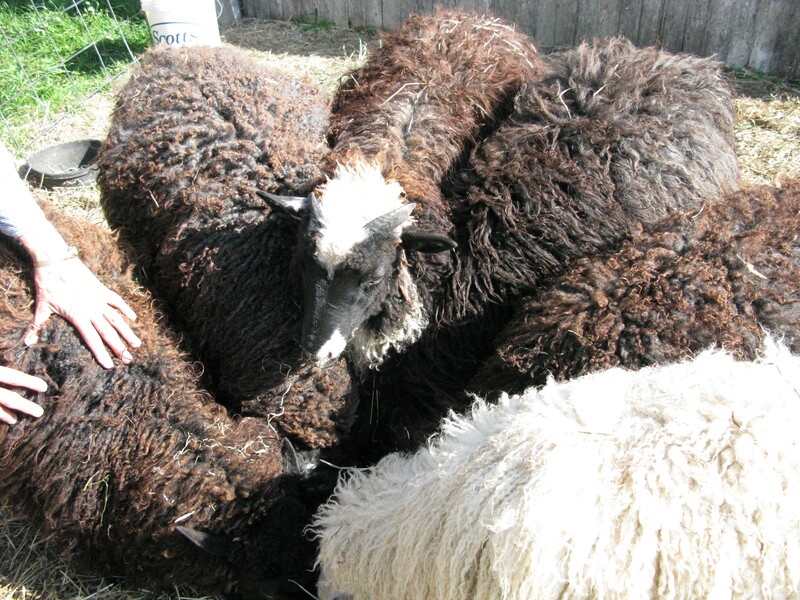 All of Nancy’s beautiful long-haired sheep were shorn on Good Friday, leaving them a bit patchy-looking. Normally they would have been in a distant pasture eating fresh greens, so we appreciated the fact Nancy kept them in the barn for viewing. From an earlier trip, here’s how they look in full long-fibered glory. We met in a room at the edge of the barn with thick, white-painted timbers and spinning wheels and looms flanking the walls (plus long-haired rabbits in cages!). The wind was howling outside, yet it was quiet inside. 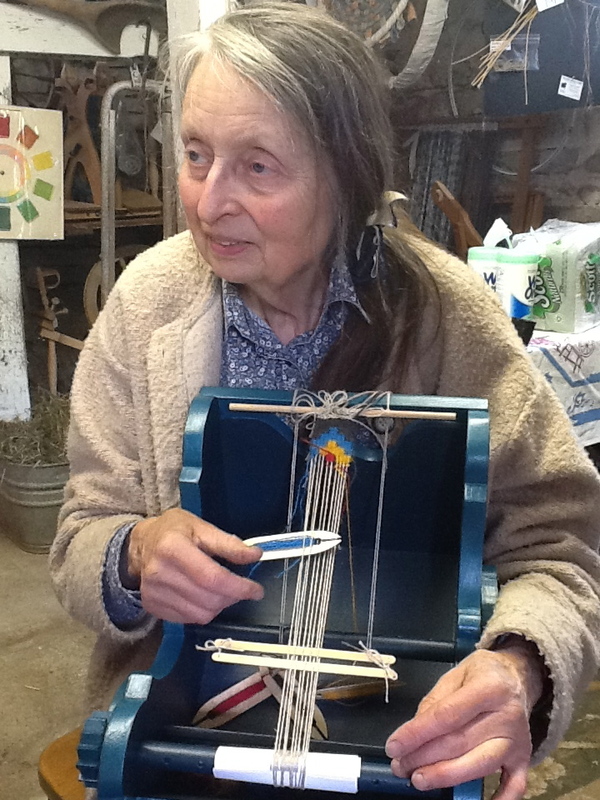 Nancy will be teaching a cradle loom class this summer. 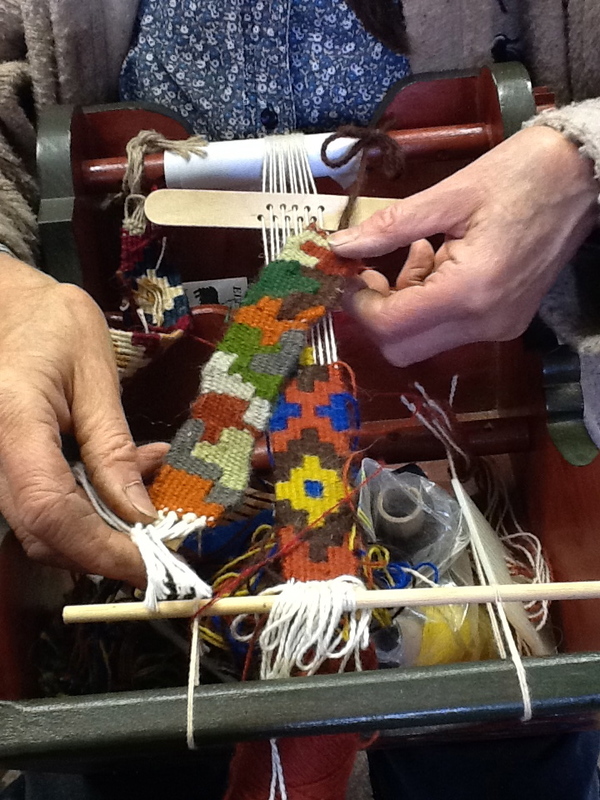 She showed us cradle looms with a completed slit tapestry and one in progress. Inspired by observing her warping method and by her completed pieces, Jan Mostrom, Mary Skoy and I are all meeting to warp our cradle looms later this month. We all have lovely rosemaled cradle looms which we have NEVER USED. For Pete’s sake, we only have to warp 10 threads! How long could it take? We’ll report later on our progress. A remark about Decorah and the Norwegian-American Museum sparked a great story from Lila Nelson about manners and creative problem-solving. Years ago, King Olav gave money to Vesterheim that was used to install a state-of-the-art textile washing station. Old textiles could be submerged flat and gently into the large shallow basin. During a Royal Visit to Vesterheim, the new equipment was on display in demonstration mode. Lila and others needed to show how it was done, complete with wearing heavy rubber gloves to protect their hands and the textile. But how would that work with the king’s well-known desire to shake hands with the people he met? In the end they decided to sort of fake the actual washing step. They pulled their right-hand gloves almost completely off their hands, so that when the King came close – whoosh, off came the glove. Awkward rubber glove pulling, struggling and snapping would put a dent in trying to appear poised, wouldn’t it?